A Fiji raised, South Auckland poet will write his second book of poems and short stories as the recipient of the 2012 Fulbright-Creative New Zealand Pacific Writers’ Residency. The residency offers a New Zealand writer of Pacific heritage the opportunity to work for three months on a creative writing project exploring Pacific identity, culture or history, at the University of Hawai‘i. 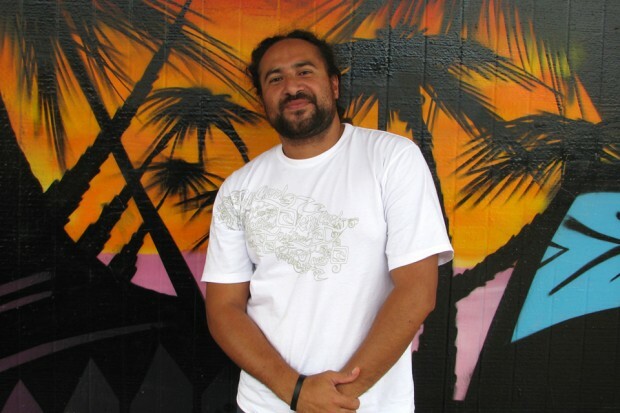 Daren Kamali, (Fijian and Wallis and Futuna descent) is a poet, author and performer. The co-founder of the South Auckland Poets Collective and Niu Navigations Company, Daren has been described as a lively, experimental and thoughtful writer who works across genres and languages. As a native speaker of his Fijian language, Daren works with metaphors, imagery and rhythm of Fijian, English and Māori languages. Recently Daren represented New Zealand at the 2012 Brave New Voices Festival (San Francisco), the 7th Annual Spoken Word and Hip-Hop Educator and Community Leader Training Institute (Wisconsin) and the 11th Festival of Pacific Arts (Solomon Islands). Leaving for Hawai‘i in late August, Daren will use his residency to write Squid Out of Water, a collection of 25 poems, 10 short stories and a CD of performance poetry pieces. It will be the sequel to his first book Tales, Poems and Songs from the Underwater World which was published in 2011 and funded by Creative New Zealand’s Pacific Arts Committee. Daren was raised in Fiji and migrated to New Zealand in 1992. He is currently in his second year of a Bachelor of Creative Writing degree at Manukau Institute of Technology. Fiji remains central to Daren’s poetry, underpinning his first book and its proposed sequel. Daren will be based at the Centre for Pacific Islands Studies at the University of Hawai‘i at Mānoa in Honolulu. Hawai’i has been identified as a strategic location for artists and is considered the hub of Pacific writing with numerous universities, library resources, networks, writers’ forums and publishers. It is an important link to the United States mainland and has a strong Polynesian culture.